In this lesson, we will learn how to apply the distributive property to evaluate expressions and solve problems including real-life situations. The average attendance per game during a season of baseball was about 65,000 people. 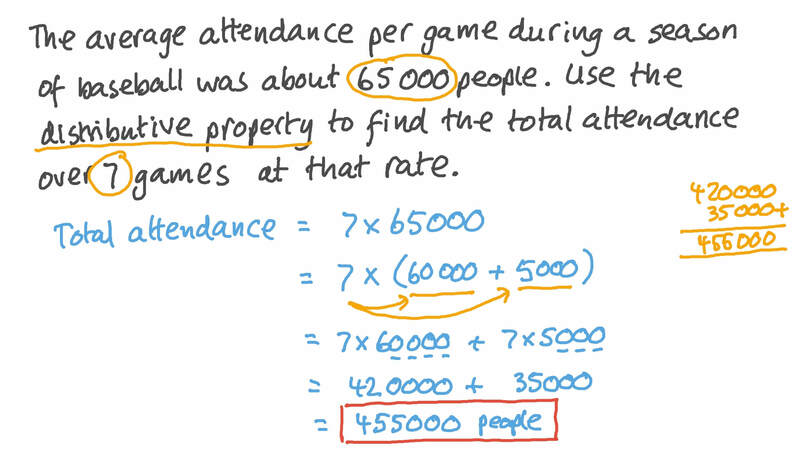 Use the distributive property to find how many people attended 7 games during that season. Fill in the blank: 4 0 0 = ( 3 × 1 0 0 ) + ( × 1 0 0 ) . Given that 𝑥 × ( 6 + 9 ) = ( − 7 × 6 ) + ( − 7 × 9 ) , find the value of 𝑥 . Using the distributive property, calculate 5 9 + 5 9 × ( − 4 9 ) 2 . Use the distributive property to calculate the value of 7 6 + 7 6 × 2 5 − 7 6  . Using the distributive property, calculate 1 2 + 1 2 × 8 8  . Using the distributive property, calculate 5 7 × 4 7 − 4 7 2 . Nada is trying to figure out the cost of 8 juice boxes that are sold for $4.11 each. Which of the following mathematical sentences can be used to help Nada do her calculations easily and states the real number property applied? Sherif bought 7 new outfits for $65 each for his wardrobe. Determine the expression that represents the total cost. Using the distributive property, determine an equivalent expression that can be used to calculate the total cost mentally. A print shop charges $0.04 to print a page in black and white and $0.16 to print it in colour. Use the distributive property to determine the total cost of printing 27 pages in both black and white and colour. Evaluate and simplify 3 8 × 9 1 6 + 5 1 6 × 1 2 + 3 8 × 1 8 + 5 1 6 ×  − 1 8  properties of real numbers. Use the number bonds to help you find the missing numbers in the equations. Use Sameh’s fact to find the missing numbers. A DIY store has 154 hammers and 171 screwdrivers on sale for $9.03 each. Determine how much money the DIY store will earn if all the hammers and screwdrivers are sold. If the selling price decreased to $6.69, determine how much money the store would earn then, and calculate the difference between the store’s earnings for both prices.